Spring is upon us, and you might find yourself weighed down by unnecessary objects or unorganized school supplies. This is the perfect time for spring cleaning. By following a few feng shui tips and tricks, you may find you can breathe easier and keep your stress levels down. Feng shui is the Chinese art of positioning important objects to enhance the circulation of “chi,” which is often translated as air, breath or energy flows. This practice originated over 3,000 to 6,000 years ago to balance energies in an inhabited space to guarantee good health and fortune. Feng shui became popular in the states in 1972 after Richard Nixon visited the People’s Republic of China. “When we shift or enhance the energy of a living space, that energy then supports us to attain our goals and dreams. If a living space is cluttered and messy, that is the energy working through one’s life,” said Stacy Davenport, who studied with master feng shui expert Lin Yun from Beijing, and is currently a feng shui consultant in Austin. Stacy attributes all of her success to the feng shui that she has incorporated in her life. By rearranging the furniture according to feng shui principles, she said she became more financially successful. According to feng shui experts, by incorporating a few tips to enhance the layout of your bedroom, you can elevate your happiness. It’s best to make adjustments on a day-to-day basis and not try to reorganize your whole space. Most importantly in feng shui, it’s essential to de-clutter your living space. Davenport is inclined to use the number 27 because two and seven add up to nine, which is an auspicious number for feng shui. The bagua grid, a main tool of feng shui that’s used to evaluate how energy moves by vibration in a given space, has nine sections. A good tip for those who are feeling the stress of the approaching end of the semester is to clear your study space of clutter, and you’ll find yourself able to focus better. Make sure that your living space doesn’t become a storage area, and since doors are associated with opportunity, leave the entrance to your room clear of any disorder. A tip for any singles out there who are looking to find a mate: According to feng shui principles, if you clear out a few unused items and make way for empty space, it will create the emotional space to increase your liveliness and allow for new relationships. If you can’t find the strength to rearrange furniture, focus on merely bringing life to your bedroom. “Add lots of green, growing plants and think of your spaces and places as energizing and overflowing with wonderful energy,” Bourland said. While some aspects of feng shui focus on your connections with others, most are centered on improving yourself. A lot of this focus is on where you rest. If you don’t have time to rearrange your entire bedroom, pay attention to some important tips for your bed to ensure the increase in energy that comes from a restful night’s sleep. 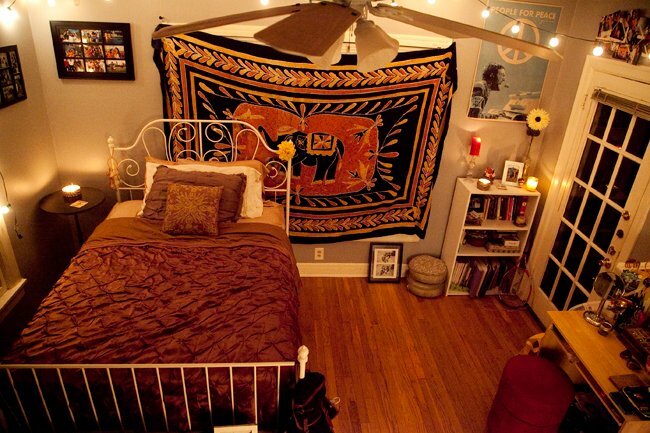 Feng shui advises that you place your bed diagonally across from your bedroom door. When you have a clear view of the entrance to your room, it creates a feeling of security while you sleep, allowing you to be completely relaxed. The foot of your bed should never point directly out of a door that leads outside of your room. Feng shui states this bed position is like a coffin and doesn’t allow for even traffic to flow in and out of your room. It’s also recommended that those looking for a more restful sleep get new bed pillows. There are hundreds of feng shui tips, and it’s virtually impossible to incorporate every one of them into your life, but if you try a few at a time, you may see some changes in your chi and stress levels. “By working with the ancient feng shui principles, it allows me to manifest whatever I desire easily,” Davenport said.